They fought on Lexington Green the first morning of the Revolution and survived the bitter cold winter at Valley Forge. They stormed San Juan Hill with Theodore Roosevelt’s Rough Riders and manned an anti-aircraft gun at Pearl Harbor. They are the black Americans who fought, often in foreign lands, for freedoms that they did not enjoy at home. 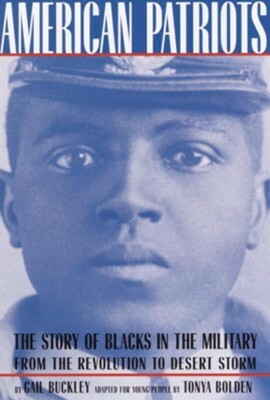 Adapted for young readers, this dramatic story brings to life the heroism of people such as Crispus Attucks, Benjamin O. Davis, Charity Adams, and Colin Powell, and captures the spirit that drove these Americans to better their lives and demand of themselves the highest form of sacrifice. Gail Buckley’s family history, The Hornes, was a national bestseller. She is a journalist and daughter of the legendary singer-actress Lena Horne. Tonya Bolden is the author of Rock of Ages: A Tribute to the Black Church and Tell All the Children Our Story: Memories and Mementos of Being Young and Black in America. I'm the author/artist and I want to review American Patriots: A Young People's Edition: The Story of Blacks in the Military from the Revolution to Desert Storm - eBook.